Once upon a time, Newfoundlands were a very popular canine companion to keep, or so it seems. Emily Dickinson, one of America’s most beloved poets, joined the ranks of Newfoundland lovers when she was bestowed a little pup in her lonely youth by her father. The Emily Dickinson Museum believes her new friend was meant to keep her company on the long walks she traversed through the Amherst fields and woods. Author Marty Rhodes Figley was able to get a firsthand perspective of sorts in researching the subject matter for “Emily and Carlo”. She studied the American icon in college and interned at Emily’s homestead, the Evergreens, for a semester, imagining what a typical day in the life of the two would look like. As the pages turn, you’ll discover a tranquil, happy life: Carlo enjoying Emily’s heart-shaped cakes, Carlo playing with the children in the extended family, and the two of them seeking out frogs in a nearby pond. But what really hits home is the wonderful bond the two of them had and shared for sixteen years. It might go without saying, but this would be a great text for an adult to read with a child. Had I been in the book’s target demographic, I know I would’ve needed a bit of help in translating/understanding some of Emily’s poetry. 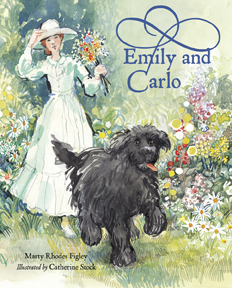 Overall, “Emily and Carlo” is a sweet escape from 21st century living and a unique way to approach the work and life of Emily Dickinson.